Are you aware that the State Veterinarian has adopted rules that need clarification from the legislature with respect to foster facilities and occasional operations? The result of these new rules now allow people to sell puppies from Walmart parking lots without a license and force licensed rescues to cease operations. I am concerned about the threat posed to public health and animal welfare. If you prefer, you may send them a link to this post. Thank you! You may also want to share this very important rescue organization public notice with them as well. I just got off the phone with my girl Rhonda in Virginia. It turns out she is a mutual friend of my girl Lisa in the neighboring county who fostered Scilly before she got on the transport truck and headed my way to New Hampshire. It seems Rhonda needs some money to help her clean up homeless dogs before they get adopted. I told her I would be happy to donate mine and maybe some friends might join me. She is also having a hard time communicating with the boys down at county about why it makes sense to implement an incentive based spay/neuter program and educate people about the importance of vaccinations and overall humane treatment of animals. I told her maybe she and I and the boys could have a little chat over dinner and see if we could exchange ideas and share concerns. Of course, any proposals for changes to the county laws would be publicly noticed and open to the public for comment. I will be heading to West Virginia soon to see first hand what Rhonda is dealing with in her neck of the woods. I am going to ask a filmmaker friend of mine if maybe he would like to join me. I just want to make sure that my travels do not conflict with any public hearings should any of these legislative service requests regarding dogs become bills that are hoping to become laws that will allow people to profit off of the homeless dogs that my friends and I are trying to save on our own time with our own money. I have a lot of friends, and I will bring them all to Concord and none of us will be wearing an orange badge. This is our public notice. Thank you. Please share. 2. For current RSA 437 license holders, a copy of a current official health certificate is on site for each animal that is transferred to the public. as you see this gives enough rules that "anyone" won't be adopting dogs at walmart as you imply. I know you do not understand, Diane. The JLCAR rulemaking process is rather complex. Do you know that members of the rescue community showed up at the agency's public hearing and spoke to an empty microphone. Do we even know that the State Veterinarian listened to that tape? He did not offer any comments about the rescue community's input in any of the transcripts that I read. So, please can you stay off the phone with him for a bit. He tells me he is trying to be responsive to my requests for information about why this will protect public health. I don't understand what you are getting at. The rules are the same now as they have been for years and years. Just clarified a LITTLE. Just because a bunch of these newer groups GOT AWAY with having a broker license and yet using foster homes does not mean it was right. NOTHING has changed rule wise except that closer attention will be paid to brokers to make sure they are following the rules, where before not much attention was paid to that. NOTHING is going to change as far as how many dogs can be saved, nothing. Unless of course a group was skirting the rules by being a broker and still having foster homes-which they were never supposed to! Dr Crawford is an EXCELLENT state vet he is doing a good job with a crap budget in protecting the state animal health.and the info you want is there just not logged due to budget cuts deeming the person that did it no longer was there. I used to manage a large kennel that housed imported rescue dogs for multi groups. We were licensed and inspected a LOT. I have seen first hand the illnesses that come up with rescue dogs. 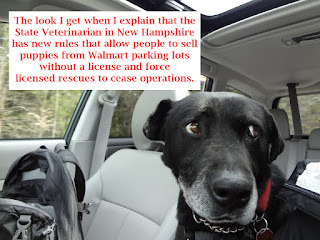 These rules are necessary.These are the same rules NH rescue groups have been abiding by for MANY years, what makes the groups you work with so special that they can't when hundreds of other groups have and are? That explains a lot, Diane. Thank you. So, the 48-hour quarantine that was put in place in 2012 because of all these sick dog complaints and without input from the volunteer, non-profit rescue community made that kennel quite a bit of money didn't it? It forced a woman I know to give up the mudroom space in her house at her own cost in order to meet this requirement. 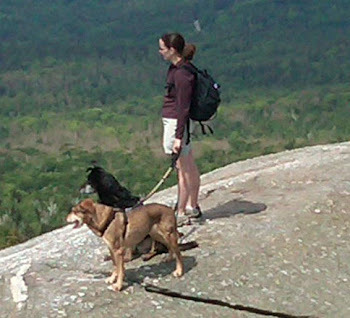 Volunteer rescuers are so successful because of the customer service and marketing abilities that have saved dogs that would otherwise be killed. They are not profiting from this work. Thanks for finally showing me your interest in this issue. I get it now. Okay, so apparently my friend Diane's comments are not even registering through spam, so she asked that I clarify for everyone that she did not profit off of boarding for rescues. She wants to clarify that she did not profit off a non-profit rescue, "actually NO. I managed the kennel from 1995 - 2006. The dogs we housed we did so because the groups needed a place to keep their dogs when they first came in the state. There was no mandatory quarantine then. We charged rescues boarding at under cost. The kennel made no profit off the rescue dogs. We boarded dogs for Greyhound pets of America, Puppy Angels, North East Rottweiler Rescue and more. We also boarded a ton of Hurricane katrina dogs. also below cost."